Re-reading the Fantastic Four comics from the start. Reed Richards disappeared five issues ago, and in issue #261, we get some answers. Open up the comic and the first page is Sue and Namor kissing! Wha-hey! Turn the page, though, and we see that this is just a friendly goodbye kiss. Namor is dropping off Sue at home after they helped Alpha Flight defeat a baddie known only as the Master. Namor and AF member Marrina take off for Atlantis, and Sue heads inside. She finds the Baxter Building empty, and wonders where Reed is. She calls Avengers Mansion, where Jarvis the butler tells her the Avengers are on board the S.H.I.E.L.D. satellite, investigating a strange beam that struck the mansion earlier. 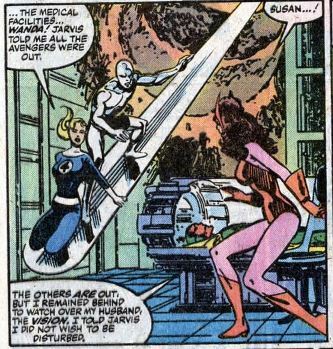 The Silver Surfer, who was resting in the Baxter Building infirmary, wakes up and compares notes with Sue. He reminds her (and the reader) that he came to New York investigating that same beam. The Silver summons his surfboard from where it was buried in the wreckage of the Terrax/Tyros fight. He and Sue travel to Avengers mansion. The Scarlet Witch is there, watching over the still-comatose Vision. 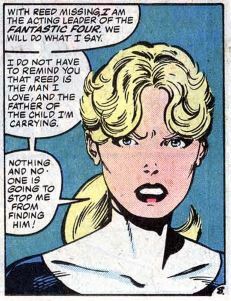 She tells Sue what she saw when Reed was abducted (in issue #257). 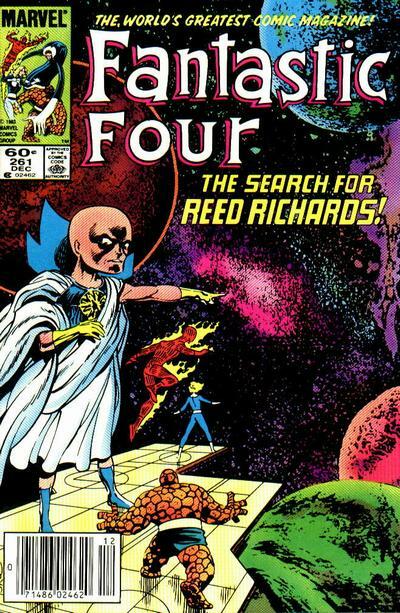 The Silver Surfer uses the power cosmic to do the “psychic investigator” thing to confirm that Reed is no longer on Earth, but was transported somewhere way out in the cosmos. Sue meets with Reed and Johnny, insisting that the three of them leave for space. Johnny and Ben remind her (and the reader) that she’s pregnant. Sue shuts them up, saying that when Reed isn’t there, she becomes the official leader of the FF. With that, everyone boards the FF’s rocket ship, with Sue saying she knows someone in space who can help them. (The Silver Surfer is still exiled on Earth and cannot follow.) 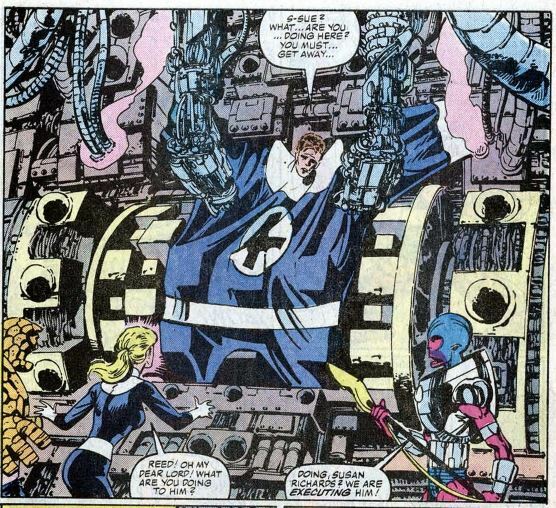 The story pauses at this point, so writer-artist John Byrne can take a few pages to depict his own version of the FF’s origin story. The flashback ends as our heroes arrive at the blue area of the moon, home of the Watcher. 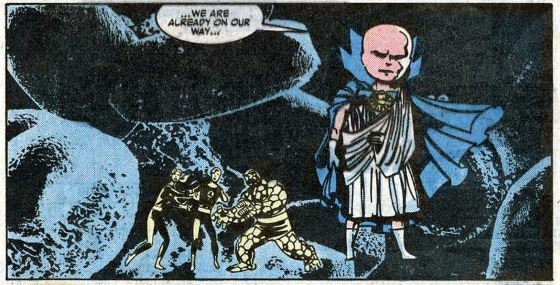 Not only does the Watcher know the FF were coming, he has already consulted with people and been given permission to get involved. (Let’s take a second here to notice that the Watcher has been completely redesigned. Instead of looking like a big bald guy, he’s now a lot more alien, with a huge head on top of a spindly thin arms and legs.) The Watcher teleports the FF across the galaxy, to a massive fleet of spaceships. He says these are the survivors of Galactus — aliens who’ve had their homeworlds devoured by the big G and who have now banded together in their space-homelessness. The FF and the watcher are greeted by the survivors’ leader, Xxan Xxar. He takes them to… Reed! Reed is being tortured on this big wheel-looking thing, and it looks really painful. Xxan Xxar says Reed is to blame for the destruction of the Skrull homeworld. (Reed saved Galactus’ life in issue #244, only for Galactus to kill the Skrulls in issue #257. So much continuity!) A fight breaks out when Ben tries to free Reed, but the Watcher breaks it up, sealing everyone in some sort of energy spheres. We cut to later, where the survivors’ council is meeting. Reed says human compassion has him mourning the deaths of the Skrulls, and it was that same compassion that drove him to save Galactus. The Watcher says Galactus has a purpose in the universe, even if such purpose is beyond mortal comprehension. Just as the council members are about to reconsider, they’re interrupted by Lilandra, head of the Shi’ar Empire. She demands that Reed must die. Unstable molecule: When reunited with Sue, Reed says she shouldn’t be there, showing that he is resigned to his fate. Later, though, he argues for his freedom while standing with his arm around her, showing that her presence has changed his mind. Flame on: There’s a bit where Johnny flies off by himself inside the Watcher’s house, only to get lost among all the reality-defying spaces inside there. The same thing happened to the Red Ghost back in issue #10 and to Wolverine during the death of Jean Grey saga in Uncanny X-Men. 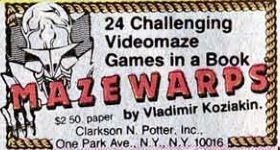 Trivia time: OK, so the story goes that this whole story is the product of infighting between John Byrne/FF editorial versus Chris Claremont/X-Men editorial. Remember when Lilandra made her dire warning to the FF in the pages of Uncanny X-Men? That was allegedly done without Byrne’s knowledge. Byrne was allegedly pissed off, and wrote this story arc as a response. I’m throwing the word “allegedly” around a lot, because the truth of what happened totally depends on who you talk to. Fantastic or frightful? Although this is mostly set up for the next issue, there’s a lot of great stuff here. I like the survivors of Galactus, and I always wished Marvel would do more with those characters. I really like Sue stepping up and finally becoming ultra-heroic. Next week: The cosmic grandeur of… it’s WHAT month?! ?